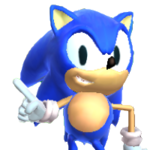 I created this 3DS Sonic mod on May 12th, 2016. The mod is under Lost World/PC/3DSLW.7z. This mod requires 7zip (or other programs that can extract 7z archives) to be extracted. Enjoy!